α-MSH is a POMC-derived peptide hormone produced in the pars intermedia. α-MSH has effects on skin and coat pigmentation, metabolism, food intake and obesity, and has anti-inflammatory effects, although may produce hyperalgesia. α-MSH may be a useful diagnostic test for PPID. Schreiber CM, Stewart AJ, Kwessi E, Behrend EN, Wright JC, Kemppainen RJ, Busch KA. 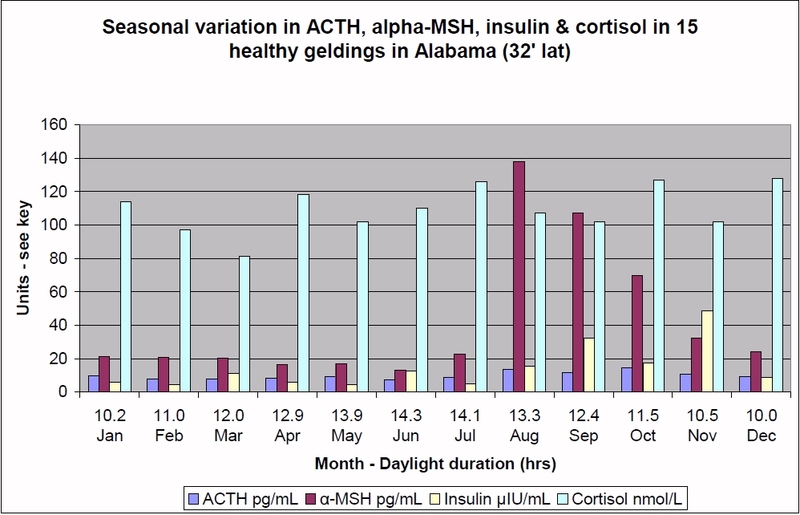 ACTH, α-MSH, insulin and cortisol were measured every month in 15 clinically normal geldings (median age 14 years). "A significant time effect was found between months for α-MSH and insulin concentrations. Endogenous cortisol and ACTH concentrations remained within existing reference ranges..."Seasonally specific reference ranges are required for α-MSH and insulin concentrations, with significantly higher concentrations detected in the fall. Practitioners should be advised to submit samples only to local laboratories that can provide such reference ranges for their local geographic region." "ACTH and α-MSH concentrations increased in all horses after TRH administration, with a greater and more prolonged increase in horses with PPID. Percentage increase was significantly greater for α-MSH concentration than for ACTH concentration." "Use of an α-MSH concentration ≥ 30 or 50 pmol/L did not appear superior to use of an ACTH concentration ≥ 36 pg/mL for the diagnosis of PPID, either before or 30 minutes after TRH administration." "The fall peak plasma α-MSH concentration occurred earlier in horses residing at more northern locations." "Concentrations of both hormones (α-MSH and ACTH) were high in the fall compared with the spring in horses with PPID." Equine α-MSH was measured by radioimmunoassay designed for use with human plasma. Blood was collected into EDTA and separated by centrifugation. Hemolysis did not significantly affect α-MSH concentrations. There was no significant difference in plasma α-MSH concentrations between males and females. It was recommended that plasma should be separated within 8 hours of blood sample collection and stored frozen (at -80'C) until assay, and as α-MSH does not appear to have a circadian rhythm, samples can be collected at any time of day. α-MSH showed a distinct seasonal rise in the autumn in healthy horses and ponies, with concentrations peaking in September in stabled horses in Canada (9.5 - 15.9 pmol/l April compared to 2.7 - 58 pmol/l September) and ponies at grass in Pennsylvania (3 - 19 pmol/l May compared to 40 - 185 pmol/l September). 6 out of 13 healthy ponies had plasma α-MSH concentrations in excess of that considered diagnostic of PPID (> 91 pmol/l) in September, therefore if plasma α-MSH concentrations are to be used to diagnose PPID, seasonally adjusted reference ranges should be used. Beech J, Boston RC, McFarlane D, Lindborg S.
"Plasma alpha-MSH and ACTH concentrations increased as daylight decreased from summer solstice (maximum daylight hours) to 12 hours of daylight." "Horses in the upper quartile of BMI had significantly greater plasma alpha-MSH concentration (median, 9.1 pmol/L; range, 2.0 to 95.3 pmol/L) than horses in the lowest quartile of BMI (median, 70 pmol/L; range, 3.6 to 15.7 pmol/L)" - NB the median figures are presumably either the wrong way round or mistyped. "CONCLUSIONS AND CLINICAL RELEVANCE:A correlation exists between plasma alpha-MSH concentration and BMI in horses. Further study is required to determine whether melanocortin receptor defects underlie this correlation or, alternately, whether plasma alpha-MSH concentration is simply a correlate of adiposity". AAKG (L-arginine alphaketoglutarate) is a support nutrient for the synthesis of nitric oxide and may help horses that suffer foot pain in cold weather. See the ECIR Group file on AAKG for more information before using as AAKG is contra-indicated in certain situations (including horses with acute laminitis, uncontrolled PPID, melanomas/ tumours or horses receiving certain drugs). Dr. Kellon: "When more help was needed, we added the amino acid arginine, in the form of AAKG - arginine alpha-ketoglutarate, to support nitric oxide sythesis. Nitric oxide keeps blood vessels dilated. All horses made it through the winter without their usual hoof pain." Horses that have had rotation and/or distal descent frequently develop an abscess (pocket of infection) anything from a few days to several weeks after the initial laminitis. Pockets of blood/serum and dead tissue between the hoof wall/sole and P3 may become infected. The abscess grows, compressing surrounding live tissue and often causing intense pain, and will usually eventually break out through the coronary band, white line or above the heel bulbs. Pressure necrosis from thin soles, stone bruises and puncture wounds may also cause sole abscesses - hoof boots with thick pads should be used to protect thin soles (and the trim and diet examined to work out why the sole is thin). The first sign of an abscess brewing is increased pain/lameness which may progress to non-weight bearing, usually in one leg, often with a bounding digital pulse and heat. There is sometimes swelling at the back of the leg above the fetlock, and there may be tenderness at the coronet or heel bulbs if the abscess is near the skin surface. Abscesses can infect joint capsules or the pedal/coffin bone, causing osteomyelitis, and can lead to euthanasia. It is important that abscesses discharge and drain. How do you tell the difference between an abscess and laminitis? If the lameness, bounding digital pulse and heat are only in one leg, it's more likely to be an abscess. Abscesses can form in more than one foot at the same time (after all, the damage from the laminitis likely occurred in more than one foot at the same time), and laminitis can be worse in one foot than others (particularly if one foot was less correctly balanced), but as a general rule, lameness in just one foot following laminitis has a good chance of being an abscess. If the initial laminitis has been controlled and nothing has changed, it's likely to be an abscess. Check that diagnosis, diet, management and trim are all as perfect as possible - if they are, look for an abscess. If the lameness appears worse than the original laminitis, it is likely to be an abscess - owners often think their horse has broken a leg when first presented with an abscess, it can be that painful. Consider the timescale - if the horse appeared to start to recover from the initial laminitis, then suddenly became lame usually a couple of weeks to a couple of months later, it's likely to be an abscess. Abscesses are often triggered by a trim - has the horse been trimmed recently, if so, it could be an abscess. Radiographs (x-rays) sometimes show the position of an abscess- see x-rays of sub-solar abscess (inclusion of link does not imply endorsement of treatment methods used). Radiolucency (black areas on an x-ray) can be caused by gas once an abscess has drained, whereas an unopened abscess usually had a density similar to tissue so will appear grey (ref: MSD Veterinary Manual). Hoof testers or a hammer may help locate the position of an abscess (be sure to differentiate whether the pain is in the wall or the sole). Thermal imaging may also help to locate heat (and therefore an abscess) within the foot. More information about abscesses following laminitis is available from Dr Eleanor Kellon's Cushing's and Insulin Resistance course. Plenty of controversy here! To drain or allow to break out naturally, to soak or to keep dry...? Tetanus - the horse should always be vaccinated against tetanus. If tetanus cover is not up to date, tetanus antitoxin should be given. Anti-inflammatory pain killers (NSAIDs) - if the pain from an abscess is severe, NSAIDs may be necessary on welfare grounds. However some vets suggest NSAIDs should not be used if possible (particularly if allowing the abscess to erupt naturally), as inflammation is needed to mobilize the abscess and cause it to erupt, and using anti-inflammatories can slow or prevent the abscess from maturing, thereby preventing healing. As soon as an abscess has burst/been released the pain will usually subside and use of NSAIDs can be stopped. Antibiotics - the use of antibiotics to treat a foot abscess before it has burst is controversial, as systemic antibiotics are unlikely to be able to reach the bacteria in the centre of an abscess, and treating an abscess with antibiotics may slow resolution of the abscess. The bacteria involved in a foot abscess are likely to be anaerobic, commonly used antibiotics tend to be effective against aerobic bacteria. Local antibiotics may be useful immediately following a sole penetration or if an abscess has been opened and damaged tissue exposed. John Stewart has an excellent section on foot abscesses in Understanding the Horse's Feet p 176 onwards. According to Pete Ramey (Care and Rehabilitation of the Equine Foot p 298), whilst draining the abscess usually provides immediate relief for the horse, it is usually impossible to avoid the risk of infection and to provide acceptable sterile care, and recurrence of the abscess and secondary infection becomes likely. Allowing the abscess to break out on its own means the abscess cycle is less likely to repeat. If an abscess is to be drained, it should be through the white line or by a hole drilled through the wall, NEVER through the sole. Whether the abscess erupts naturally or is drained, antiseptic treatments like Clean Trax or White Lightning, or 50:50 apple cider vinegar:water soaks are recommended. Warmth and movement encourage mobilization. Thoroughly clean the foot and poultice with hot Animalintex or another drawing poultice, or wrap the foot in cotton wool periodically soaked with warm water, or soak the clean foot in warm water and Epsom salts (magnesium sulphate) several times a day. Or keep the foot dry but use leg wraps or bandage over a dry poultice or nappy, or some suggest bandaging on warm towels or gently heated microwave hot pads. Some owners swear by ichthammol, which (the website claims) "works to soften the tissues surrounding an injury and to help relieve swelling and draw out the abscess contents", and can be used to pack the hoof once an abscess has started to drain. Draw the infection and keep scrupulously clean. Poultice the hole with hot Animalintex, or soak the clean foot in warm water and Epsom salts (magnesium sulphate) several times a day, or Clean Trax, White Lightning or 50:50 apple cider vinegar:water as above, to draw out all the infection. Apply antiseptic to the wound e.g. betadine - do not use anything that is not suitable for use on live tissue. Keep clean and dry - dry Animalintex or nappies make suitable dressings bandaged on to the foot, and poultice boots can be invaluable to keep dressings in place. "A common sequella of chronic laminitis in horses is repeated abscesses with variable lameness and drainage. It is unclear whether the exudate represents the debridement phase of a non-septic inflammatory process involving clearance of laminar tissue damaged during the acute episode of laminitis, or a response to a microbial infection developed by ascent of microbes from the environment to the tissue via the white line. The objective of this study was to evaluate the possibility that an undiagnosed microbial infection in laminar tissue is present in laminar tissue collected from chronically laminitic horses without an active hoof abscess. Methods to collect laminar tissue, aseptically, from control (non-laminitic) horses and those with chronic/recurrent laminitis are described. Laminae homogenates were evaluated for the presence of bacteria. Bacteria were identified using biochemical tests and sequencing of 16S rRNA and virulence genes. Laminae from chronically lamintic horses revealed 100-fold higher levels (P=0.002) of bacteria compared to control, non-laminitic horses. Although environmental organisms were identified, potential pathogens were identified. Included were Gram positive bacteria, Brevibacterium luteolum, coagulase-negative Staphylococcus spp. as well as Gram negative bacteria, enterohemorrhagic Escherichia coli and Alcaligenes faecalis. Further research is warranted to evaluate the role of bacteria in equine chronic laminitis." Acepromazine (ACP) is a phenothiazine derivative and dopamine antagonist commonly used to sedate horses - www.drugbank.ca - Acepromazine. "Recent research indicates that drugs used to promote digital vasodilation for decades, including acepromazine... are ineffective", suggesting that mechanically loading or unloading the foot is more likely to affect lamellar circulation than medical treatment. Effects of intramuscular administration of acepromazine on palmar digital blood flow, palmar digital arterial pressure, transverse facial arterial pressure, and packed cell volume in clinically healthy, conscious horses. Leise BS, Fugler LA, Stokes AM, Eades SC, Moore RM. "CONCLUSION: IM acepromazine causes hypotension and increases palmar digital blood flow over time but the magnitude of the effect on digital blood flow was not sufficient to yield differences compared with saline-treated horses." The effect of oral isoxsuprine and pentoxifylline on digital and laminar blood flow in healthy horses. "Horses also received acetylpromazine as a positive control (0.066 mg/kg, intravenously)....Acepromazine resulted in a significant increase (P = .0007) in DBF" (Digital Blood Flow) "for approximately 75 minutes beginning 15 minutes after treatment. A mild but insignificant increase in LP" (Laminar Perfusion) "was identified after acetylpromazine treatment....Acepromazine caused an increased blood flow to the digit. Based on the results of this study acetylpromazine potentially would have a greater effect on improving digital blood flow than oral isoxsuprine or pentoxifylline when treating ischemic conditions of the foot in horses." Can ACP be given to a horse that is taking Pergolide? Generally no, unless specifically instructed by a vet. ACP is a phenothiazine, a dopamine antagonist. Pergolide is a dopamine agonist. The two drugs have opposing effects. Therefore ACP could reduce the effectiveness of pergolide/Prascend. "Phenothiazine tranquilizers such as acepromazine may interfere with the action of pergolide and dopamine antagonists should not be administered together with pergolide because they reduce its efficacy." "Dopamine antagonists, such as neuroleptics (phenothiazines), domperidone, or metoclopramide ordinarily should not be administered concurrently with pergolide mesylate (a dopamine agonist); these agents may diminish the effectiveness of pergolide mesylate." ACTH (also known as corticotropin) is a hormone, secreted from the pituitary gland, that stimulates the adrenal glands to release cortisol (and to a lesser extent, aldosterone). ACTH is derived from a hormone precursor protein, POMC (proopiomelanocortin). In healthy horses nearly all plasma ACTH is produced from POMC in the pars distalis in response to CRH (corticotropin releasing hormone) or AVP (arginine vasopressin) secreted by the hypothalamus. When cortisol reaches a certain level in the blood, a negative feedback signal causes a decrease in the secretion of CRH, AVP and ACTH. Although in the healthy horse ACTH is also produced from POMC in the pars intermedia, most of the PI ACTH is converted into α-MSH and CLIP. Horses with PPID have a reduced amount of dopamine acting as a break on the production of POMC in the pars intermedia, causing increased amounts of ACTH and other hormones to be secreted. Is the ACTH in PPID horses bioactive? See Forum for more information and to comment. "Equine Cushing's disease is caused by hypersecretion of ACTH by hyperplasia or adenomas of pars intermedia (PI) cells, in contrast to human Cushing's disease, which is caused by hyperplasia or adenomas of pars distalis (PD) ACTH-secreting cells. We assayed both bioactive and immunoreactive (IR) ACTH in two normal equine pituitary glands and in the PD, PI, and pars nervosa of four such glands, as well as in the PI adenomas of five horses with Cushing's disease. In normal horse pituitaries, as in those of other species, most of the bioactive and IR-ACTH was found in PD, much less in PI, and only traces in pars nervosa. In PI adenomas of horses with Cushing's disease, bioactive ACTH concentrations were similar to those in normal PI, but the total tumor content of bioactive ACTH exceeded that of normal whole pituitary. IR-ACTH concentrations were even higher in PI tumors, suggesting that some of the tumor ACTH was biologically inactive. Plasma IR-ACTH, which, like the PI adenoma tissue, presumably included a major fraction of bioactive ACTH, was greatly elevated in five horses with Cushing's disease and would account for the adrenal hyperplasia and hyperfunction observed in these animals." Andy Durham of Liphook Equine Hospital on PPID diagnostic tests: "the main one undoubtedly is looking at the levels of a hormone called ACTH in the horse's blood stream, which is a fairly simple test, ...it just requires a one-off blood test to look at the hormone level and it can be done at any time of day in any time of year on any individual." However check with the individual lab for their handling protocol. ACTH is affected by season, age, diet and stress - see below. Are ACTH levels constant or are pulsatility/ultradian rhythms an issue? ACTH is released in a pulsatile manner and ACTH concentrations can vary significantly ("There is significant hourly variation in ACTH in horses/ponies with very high initial values" - Thomas Divers), therefore some vets recommend taking more than one blood collection when testing ACTH. Can ACTH be tested during the seasonal rise? - as long as a seasonally adjusted reference range is used. 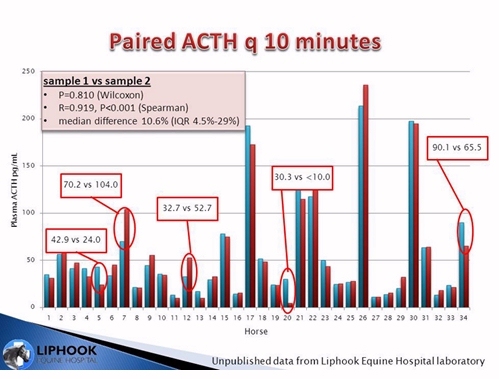 Liphook tested ACTH from 156 normal horses every month for a year and plotted the upper limit reference interval. August, September and October had a mean upper limit of 47 pg/ml with September having the highest at over 50 pg/ml. The mean upper limit for the rest of the year was 29 pg/ml with January, March, July, November and December all having mean upper limits over 30 pg/ml. Cathy McGowan echoed this in her 11 August 2011 Prascend webinar - "if you test ACTH in the autumn with seasonally adjusted ACTH reference ranges, you have an increased chance of picking up PPID cases", and Cathy suggested that if an ACTH test has not previously been diagnostic, it could be worth retesting ACTH in the autumn. Doesn't the blood for ACTH testing need special handling? Liphook have found that delayed separation of plasma has no significant effect on ACTH levels, and centrifugation before arrival at the laboratory may not be necessary - "Gravity separated plasma may be sent chilled to the laboratory as long as it is centrifuged by the testing laboratory before analysis." "Clinically useful results are still obtained if ACTH concentration is measured up to 48 h after sample collection. Allowing samples to separate by gravity rather than centrifugation did not have a significant effect on ACTH concentration". Equine Vet J. 2002 Nov;34(7):679-85. "The ACTH was stable when whole blood was collected and held in plastic tubes for 8h before separating the plasma." Mean (human) ACTH concentrations in whole EDTA blood stored at room temperature decreased by no more than 10% in 24 hours (using chemiluminescent assay). ACTH in uncentrifuged samples decayed more rapidly than immediately centrifuged samples. ACTH concentrations in some samples decreased far more than others. Centrifugation and separation of plasma is recommended within 4 hours of sample collection. What can cause ACTH to increase or decrease? Any form of stress - illness, pain, e.g. from laminitis, excitement, exercise, travelling, use of a twitch, veterinary procedures, e.g. dental work, fear of vet/needles - could increase ACTH from the pars distalis. Some medicines increase ACTH, e.g clenbuterol (Ventipulmin), and some sedation drugs may affect ACTH (both increase and decrease), insulin or glucose. See Does a high ACTH result mean my horse has PPID? Freezing the blood sample before it has been separated by centrifuge can cause falsely high ACTH concentrations. 50 healthy horses had baseline ACTH of 17.1 pg/ml before feeding and 46.1 pg/ml 2 hours after feeding. 6 healthy horses had TRH stimulated ACTH (10 minutes after being given TRH) of 124.1 pg/ml before feeding and 192.6 pg/ml 2 hours after feeding, and TRH stimulated ACTH (30 minutes after being given TRH) of 40.1 pg/ml before feeding and 73.2 pg/ml 2 hours after feeding . "In addition to season, feeding is a potential confounding factor when measuring baseline or stimulated ACTH in horses. In conclusion, feeding status should be standardized for the diagnosis of equine pituitary pars intermedia dysfunction." What are typical ACTH results and normal reference ranges? From Donaldson et al. 2005 using chemiluminescent immunoassay normal ref range 9 - 35 pg/ml - all horses and ponies were supposedly healthy (non-PPID) with no symptoms of PPID and negative DST in January (some of the September results would be considered diagnostic of PPID using current seasonally adjusted reference ranges!). See Donkeys and mules for donkey ACTH reference ranges. No - none of the laboratory tests for PPID are 100% accurate. Clinical signs should always be considered as well as laboratory results. Assessment of ACTH assay variability: a multicenter study. Pecori Giraldi F, Saccani A, Cavagnini F; Study Group on the Hypothalamo-Pituitary-Adrenal Axis of the Italian Society of Endocrinology. "Field ACTH assays have to be interpreted with caution as they are burdened by high variability and often fail to correctly identify patients with suppressed ACTH secretion." ACTH can be measured by RIA or CIA - click here for definitions of RIA and CIA. Adiponectin is an adipokine, a cytokine (or cell signaling protein) secreted by adipocytes (fat cells)/adipose tissue. Leptin is another adipokine. Adiponectin concentrations appear to reflect metabolic problems due to obesity, such as insulin dysregulation, whereas leptin concentrations appear to reflect fat mass. Adiponectin has anti-inflammatory actions, decreases vascular tone and increases insulin sensitivity. ​Obesity and glucocorticoids lower adiponectin concentrations, and hyperinsulinaemia suppresses adiponectin receptor expression, potentially causing adiponectin resistance. "Following research over the last 5 to 10 years, the Liphook Equine Hospital is the first (and only) laboratory internationally to have validated an HMW adiponectin assay for use in equine practice. Adiponectin is best measured in serum (red top) and is stable for at least 48 hours when chilled. There is no circadian pattern or gender/age effects in horses, and adiponectin is not notably affected by feeding or exercise. Weight loss programmes have been shown to restore normal levels." Adiponectin concentrations measured by radioimmunoassay (RIA) have been lower in ponies that had had laminitis or ponies that went on to have laminitis, than non laminitic ponies. Immunoturbidimetric (IT) and enzyme linked immunosorbent (ELISA) assays for equine total adiponectin concentrations (TAC) and high molecular weight adiponectin concentrations (HMWAC) were evaluated at RVC and Rainbow Equine Lab. "The IT assay was precise and demonstrated good agreement with the previously validated radioimmunoassay" - IT is suitable for measurement of TAC. Elisa was not suitable for measurement of TAC or HMWAC. Previously laminitic ponies had a mean TAC of 8.9 μg/mL compared to never laminitic ponies mean of 24.2 μg/mL. Of the never laminitic ponies, those that went on to develop first time laminitis within a year had a median TAC of 4.8 μg/mL (interquartile range 2.65-13.4 μg/mL), whilst those that remained laminitis free had a median TAC of 19.9 μg/mL (interquartile range 9.95-31.5 μg/mL. Total adiponectin concentration was significantly associated with laminitis occurrence within 12 months. 446 ponies aged 7 or above with no history of laminitis had body condition score, height, weight, crest height and thickness measured and adiponectin, leptin, triglyceride, basal insulin, insulin post-dexamethasone, insulin-like growth factor 1 (IGF-1), IGF binding protein 1 (IGFBP-1), IGFBP-3, C-reactive protein, von Willebrand's factor, soluble E-selectin and P-selectin concentrations tested. 72.2% were overweight (BCS 7/9 or above), 27.3% were ideal weight (BCS 4-6/9), and 0.5% underweight (BCS 1-3/9). After 1 year 4% of ponies were reported to have had laminitis; after 2 years 6.7% and after 3 years 9.9%. Adiponectin, resting insulin and insulin post-dexamethasone were significantly associated with laminitis occurrence. Conclusion: Risk factors for future laminitis prior to disease occurrence include low plasma adiponectin and high serum basal insulin or insulin post-dexamethasone concentrations. TLS note: dexamethasone increases insulin and should not be given to horses at risk from insulin dysregulation/laminitis. Vet J. 2006 Nov;172(3):460-5. Epub 2005 Jun 29. Kearns CF, McKeever KH, Roegner V, Brady SM, Malinowski K.
What has age got to do with it? Quite a lot, both for PPID and EMS. Donaldson et al 2005 found that the sensitivity of the pituitary-adrenal axis decreases with age (ACTH concentrations were generally significantly higher in older (16+) horses), and suggested exposure to oxidative stress as a possible contributing factor to both aging and PPID. However, just because it may be common for aged horses to experience loss of pars intermedia function, this shouldn't be considered normal. The paper suggests that the diagnosis of PPID may not be a "yes" or "no" diagnosis, and rather that PPID may be a slow loss of pars intermedia function which often occurs as horses get older. Acute insulin response to glucose (AIRg) was higher in aged 582.0 vs. adult 358.0 horses. Adult and aged horses had a higher insulin sensitivity on starch (adult 3.3, aged 2.8) and sugar (adult 3.4, aged 4.0) diets compared with control (adult 2.0; aged 1.4). "Advanced age is associated with a low-grade, systemic inflammatory response characterized by increased inflammatory cytokine production both in vitro and in vivo, termed inflamm-aging. It is also known that increased white adipose tissue, associated with obesity, leads to increased production of inflammatory cytokines. To date, it is unknown whether increased adiposity contributes to the age-related increased inflammatory status. Here we show that peripheral blood mononuclear cells (PBMC) from old horses compared to young horses have increased inflammatory cytokine production; moreover, fat old horses compared to thin old horses have even greater frequencies of lymphocytes and monocytes producing inflammatory cytokines. Therefore, we proposed that decreasing adiposity in old horses would reduce age-associated increases of inflammatory cytokines both in vitro and in vivo, and increasing adiposity in old horses would increase these measurements....when weight and fat increased in these old horses there was a significant increase in inflammatory cytokine production. Regression analysis also revealed significant relationships. These findings demonstrate that age-related obesity potentially plays a role in the dysregulation of inflammatory cytokine production by the immune system with age or inflamm-aging in the horse." Acetyl-L-Carnitine (ALC / ALCAR) is an ester produced by the human brain, kidney and liver which appears to increase the uptake of Acetyl-CoA into the mitochondria. Sima AA, Calvani M, Mehra M, Amato A; Acetyl-L-Carnitine Study Group. De Grandis D, Minardi C.
PLoS One. 2015 Mar 9;10(3):e0119479. doi: 10.1371/journal.pone.0119479. eCollection 2015. Acetyl-L-carnitine in the treatment of peripheral neuropathic pain: a systematic review and meta-analysis of randomized controlled trials. Li S, Li Q, Li Y, Li L, Tian H, Sun X. "In conclusion, the current evidence suggests that ALC seems effective and safe in the treatment of PNP (peripheral neurpathic pain), especially of diabetic PNP. Oral administration of ALC may be recommended due to its similar efficacy but easier administration." Does supplementation with Acetyl-L-Carnitine (ALCAR) help with weight loss? This research found that "Supplementation with (10 g per day) L-carnitine reduces subcutaneous fat deposition in the lumbar region of Mangalarga Marchador mares after training, which may be indicative of increased use of subcutaneous fat in this region as a substrate for exercise." This research found that restricting energy intake to 7 MJ/100 kg BW resulted in body weight losses, which improved insulin sensitivity and glucose metabolism, and that L-carnitine supplementation did not further improve glucose or fat metabolism. It is sometimes suggested that alfalfa or lucerne (Medicago sativa), should not be fed to horses prone to laminitis. ​Is there any science behind this? ​Alfalfa is a legume (as is clover). 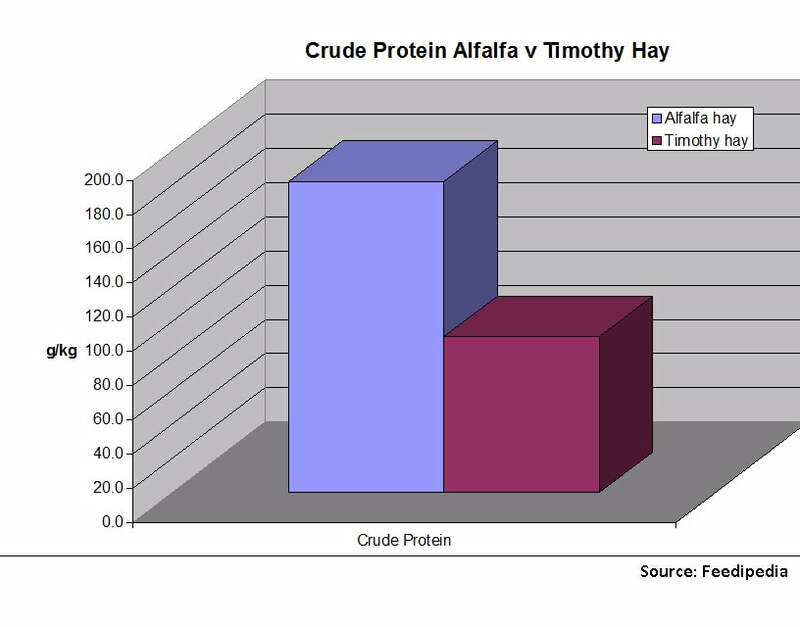 Looking at average figures for common feed profiles published by Equi-Analytical, ESC and starch figures are quite similar between legume (mostly alfalfa) hay and grass hay, but crude protein levels are much higher in legume hay than grass hay, and digestible energy is higher in legume hay than grass hay. 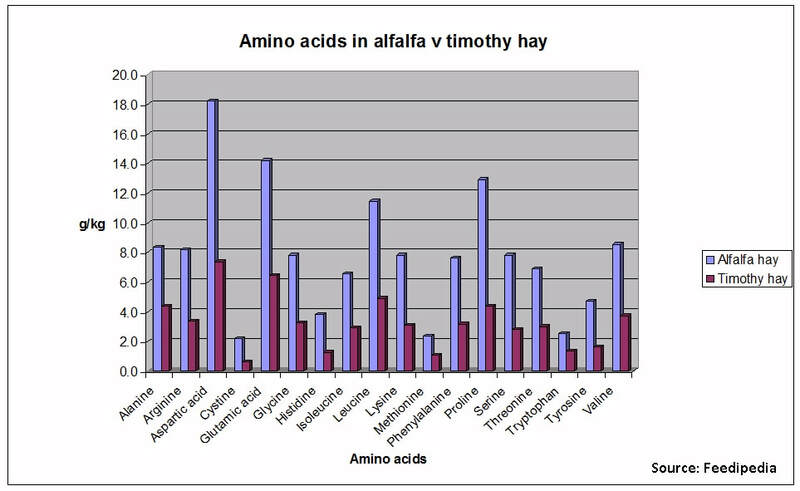 According to Equine Applied and Clinical Nutrition (2013) p 131, as long as a horse has adequate water there should be "few lasting health consequences of excess dietary amino acid intake" - so the increased protein levels shouldn't be a problem. ​In 2016, Dr Kellon suggested "for reasons that are not yet explained alfalfa can cause flares of laminitis pain in some IR horses". Trimmer Linda Cowles of www.healthyhoof.com says that "Alfalfa often results in a more brittle wall and poor wall attachment. I see this on most horses… the feet almost always get better when alfalfa is removed. Note in the above article that there is no evidence that obese horses and horses with laminitis, equine metabolic syndrome (EMS) and PPID need to have NSC levels in their diet monitored - it is likely to be ESC plus starch that horses with laminitis, EMS and PPID must keep low - there is no research showing that naturally ingested fructans cause a significant increase in insulin. Obese horses should have energy/calories limited in their diet. ​It has been noted that "alfalfa hay can be especially high in Se if grown on seleniferous soils"
"RESULTS: 5'-Adenosine-monophosphate-activated protein kinase was immunolocalized to laminar keratinocytes, dermal constituents, and hepatocytes. A high-CHO diet resulted in significantly decreased laminar [P-AMPK] in lean ponies (P = .03), but no changes in skeletal muscle (lean, P = .33; obese, P = .43) or liver (lean, P = .84; obese, P = .13) [P-AMPK]. An inverse correlation existed between [blood glucose] and laminar [P-AMPK] in obese ponies on a high-CHO diet." AMPK activation: a therapeutic target for type 2 diabetes? "There were no differences in EC50 concentrations and in maximal contractions between forelimb and hind limb arteries and veins for angiotensin II, norepinephrine, and serotonin. Incubation with endotoxin had no effect on the reactivity of arteries and veins to angiotensin II, norepinephrine, and serotonin." Anhidrosis is the partial or complete inability to sweat, and can lead to increased body temperature, increased heart rate and respiration rate as the horse is unable to dissipate heat. It may be seen in horses with PPID , particularly in hot humid climates. Hyperhidrosis - excessive sweating - is also a symptom of PPID. Anhidrosis and heat stress were primary presenting problems, with associated exercise intolerance, in PPID horses in a tropical hot and humid climate. Symptoms resolved when PPID was treated medically. Anti-Diuretic Hormone or ADH, also known as vasopressin or arginine vasopressin (AVP), is one of two hormones secreted from the pars nervosa (or posterior pituitary) in the pituitary gland. Aspirin is used for its antipyretic, analgesic, anti-inflammatory and anti-thrombotic properties in humans. Aspirin is not licensed for use in horses (in the UK). Aspirin is rapidly metabolized and eliminated and has the weakest anti-inflammatory and pain relieving activity of all NSAIDs in horses, so is rarely used for inflammatory conditions. When blood vessel walls are damaged and blood escapes, platelets in the blood clump together and form a plug or clot to protect the wound and prevent further blood loss. The activated platelets around the wound release a chemical called thromboxane, which calls more platelets to the wound site, and causes the vasoconstriction necessary for the blood vessel to heal. Aspirin blocks platelet thromboxane production, and therefore thrombus (clot) formation, for many days after aspirin is given to the horse, leading to increased or prolonged bleeding. Aspirin's anti-clotting action may be useful in treating conditions that involve formation of blood clots. However, the use of aspirin may cause excessive bleeding. "Slight rotation/descent of P3 .... Blood vessels in the solar corium can be crushed by the sharp bottom edge of P3 and cause haemorrhage (NB use of medications that affect blood clotting, e.g. aspirin, can make haemorrhage more likely to occur)"
"Horses: Due to the rapid elimination of salicylate by horses, it is questionable whether therapeutic yet nontoxic concentrations can be maintained in the horse using conventional dosage intervals". Aspirin is sometimes used to decrease thromboembolism in horses with laminitis. As at 2004 there were no studies that had investigated the safety or efficacy of this in horses. Use of other NSAIDS at the same time may decrease the anti-thrombotic activity of aspirin. Does Aspirin have a place in the treatment of laminitis? When considering any treatment for laminitis, it is essential to consider the type of laminitis (whether endocrinopathic, sepsis-related or supporting limb). Aspirin may be suggested for its (weak) anti-inflammatory effects, or for its antithrombotic effects. Dr Simon Bailey considers the role of thrombosis and coagulation in equine laminitis in chapter 12 of Equine Laminitis edited by James Belknap (2017), and suggests that there is evidence that coagulation deficits may occur in carbohydrate models of sepsis-related laminitis, that there is no evidence that endocrinopathic laminitis (due to EMS or PPID) involves coagulation deficits, and that it is currently not known whether coagulation abnormalities are associated with supporting limb laminitis. Endocrinopathic laminitis - around 90% of laminitis is endocrine laminitis, which does not involve significant inflammation nor coagulation abnormalities. Therefore aspirin is not recommended as a treatment for endocrinopathic laminitis. Sepsis-related laminitis - sepsis-related laminitis does involve inflammation, and carbohydrate-overload forms may involve platelet activation and microthrombus formation, therefore anti-inflammatories and antiplatelet therapies may be used to treat sepsis-related laminitis. Given the weak anti-inflammatory activity of aspirin in horses, NSAIDs other than aspirin are likely to be recommended. Aspirin is not mentioned as an antiplatelet therapy in chapter 12 of Equine Laminitis. Aspirin is sometimes recommended as a treatment for horses with laminitis in Europe, often concurrently with Equipalazone (Bute), presumably for its anti-thrombotic action. Aspirin should not be used at the same time as other NSAIDs. As described above, there is no evidence that endocrinopathic laminitis - the major form of laminitis, and all laminitis due to grazing, EMS and PPID - involves platelet activation or thrombus formation, and therefore anti-thrombotic drugs are not indicated, and could cause increased or prolonged bleeding, e.g. if rotation and/or sinking has damaged blood vessels, causing bleeding in the feet. J Vet Intern Med. 2011 Jan-Feb;25(1):116-22. doi: 10.1111/j.1939-1676.2010.0647.x. Epub 2010 Dec 8. Effects of clopidogrel and aspirin on platelet aggregation, thromboxane production, and serotonin secretion in horses. Brainard BM, Epstein KL, LoBato D, Kwon S, Papich MG, Moore JN. Aspirin did not decrease platelet aggregation, but did decrease serum TXB(2). Roles of thromboxane A2 and 5-hydroxytryptamine in endotoxin-induced digital vasoconstriction in horses. Menzies-Gow NJ, Sepulveda MF, Bailey SR, Cunningham FM, Elliott J. "Aspirin given 2 hours before LPS administration abolished the increase in plasma TxA2 concentration and significantly attenuated LPS-induced digital hypoperfusion. Aspirin given 4 days before LPS significantly attenuated the increase in plasma TxA2 concentration and digital hypothermia. Aspirin plus GR55562 had a greater effect on LPS-induced digital hypothermia than aspirin alone." Can J Vet Res. 2003 October; 67(4): 297–302. Antithrombotic actions of aspirin in the horse. "The antithrombotic effects of aspirin at two dose rates (4 mg/kg and 11 mg/kg bodyweight [bwt] were evaluated in normal, healthy ponies by measuring template bleeding time. Inhibition of platelet aggregation in response to adenosine diphosphate (ADP) and collagen was evaluated and cyclo-oxygenase activity was monitored by radioimmunoassay of thromboxane B2 (TXB2), the stable metabolite of thromboxane A2 (TXA2). TXB2 was measured in serum and platelet rich plasma. Bleeding time was prolonged significantly until 48 h after treatment at 12 mg/kg bwt and until 4 h at the lower dose rate. Synthesis of TXB2 and collagen induced aggregation were diminished for much greater periods with similar results at each of the dose rates. The prolonged effects of aspirin on platelet function occurred in spite of a very short plasma half-life of aspirin, because of its irreversible action on platelet cyclo-oxygenase. The results show that low dose aspirin has a potential role in antithrombotic therapy in horses although the relationship between skin bleeding time in normal horses and improvement of clinical conditions requires further research and evaluation in clinical trials. TXB2 measurement appears to overestimate the duration of antithrombotic effects of aspirin in vivo." Aspirin is not approved for veterinary use, therefore effective dosages have not been established. Aspirin has caused mucosal erosion and ulceration in dogs at therapeutic doses. Overdose in any species may result it severe acid-base abnormalities, haemorrhage, seizures, coma and death. A single dose of 20 mg/kg of aspirin may prolong bleeding for 48 hours in horses. GI irritation and bleeding are the most common side effects. Frequent use at higher doses may cause kidney damage, bleeding disorders and protein loss. Ponies and older horses may be more at risk of side effects and should be closely monitored with the lowest effective dose being used. Aspirin should be avoided (or closely monitored) in horses with bleeding disorders, liver, kidney or gastrointestinal problem; it should not be used for pregnant horses. Aspirin should not be combined with other NSAIDs or corticosteroids, or the diuretic Furosemide. Overdose of aspirin can cause gastrointestinal ulcers, liver and kidney damage and protein loss. Signs of toxicity include loss of appetite and depression. Aspirin irreversibly inhibits COX-1 and COX-2.